Well aware her daughter, Rinli, possesses powers she herself may never attain, Lisen assembles an army and awaits the inevitable war Rinli has threatened to bring down upon Garla ever since her resurrection. “I am come to break the world,” Rinli declared on her return from the dead, and Lisen knows well that no escape exists from the unstoppable stampede that is the force of Rinli’s will. Will the Thristans follow a sixteen-year-out girl into war? Can Rinli’s twelve-year-out sister succeed where their mother may fail? And what of Korin, the Thristan spouse and father left to await the outcome while remaining neutral, a stance his beloved Lisen has asked him to adopt? A family divided. A world in torment. A magical dome conjured up to protect Thristas from the forbidden. This is where Lisen of Solsta’s story reaches its climax, on a battlefield in the desert. 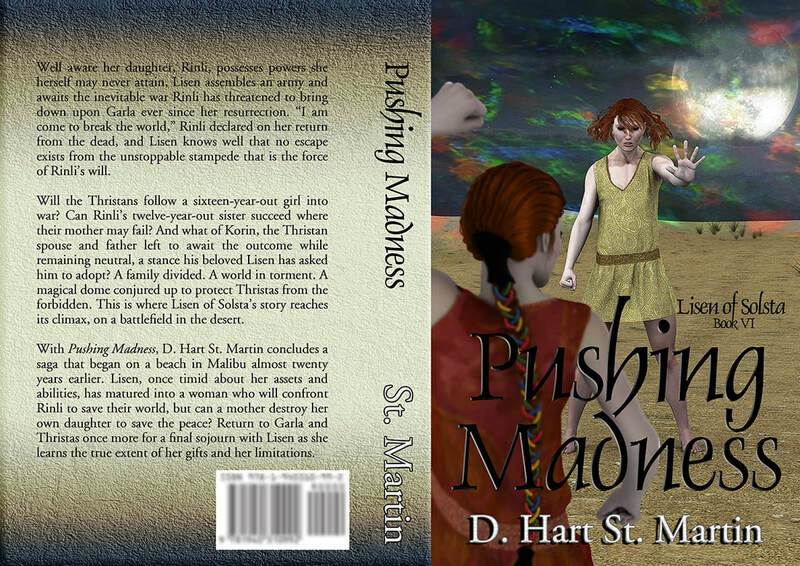 With Pushing Madness, D. Hart St. Martin concludes a saga that began on a beach in Malibu almost twenty years earlier. 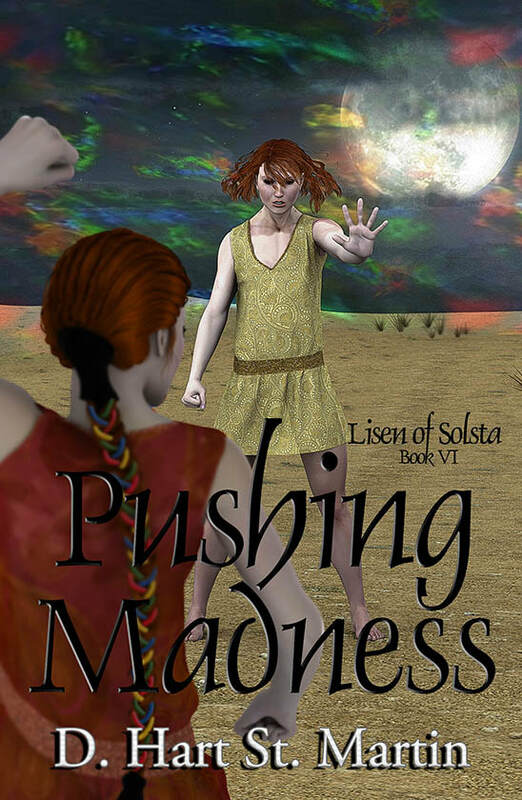 Lisen, once timid about her assets and abilities, has matured into a woman who will confront Rinli to save their world, but can a mother destroy her own daughter to save the peace? Return to Garla and Thristas once more for a final sojourn with Lisen as she learns the true extent of her gifts and her limitations.